Where do I use my Three Mobile voucher code? 'Download the app for great offers and deals." "Find great offers on the Three Mobiles homepage." For great deals and prices on mobile phones check out Three. A reliable, 4G network that you can trust. You can find affordable package deals, monthly contracts, Pay As You Go deals and SIM Only deals for competitive prices on the latest Mobile phones including the iPhone 7. Visit their website now for more information and find great mobile phone deals that you will love. Find a range of deals on Three mobile that suit any need and budget. Whether you’re looking for the latest iPhone, Samsung or HTC handset you can be sure to find a great deal on your selected mobile. Once you’ve chosen your device you can decide if you want to pay monthly payments on a contract or on Pay As You Go. Three has the UK’s lowest Pay As You Go rates and great SIM Only deals. So, whatever you want, you’ll find a huge selection of mobile phones and tariffs on offer with Three. If you want to know whether you’re due an upgrade simply text Three and they’ll let you know when your upgrade is due. Once you know when your contract is up you can login into your Three account and select what you would like to do next. If You want to upgrade a SIM plan, iPad, tablet, dongle or mobile WiFi you can as long as all your previous bills are paid. If you're on a 1 month SIM deal, you can upgrade to a package with a phone after you've been with Three for three consecutive months. 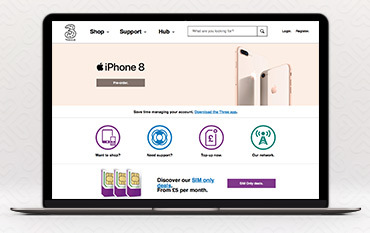 Upgrading your mobile with Three couldn’t be easier, simply visit their website for full details on your next upgrade. Three is one of the 5 cellular networks in the UK. It has an average 3G download speed of 4.3 Mb/s, which is better than the global average of 1.8 Mb/s. Three is a 4G network with the latest generation of cellular technology, allowing high definition video streaming and crystal clear voice calls, providing great coverage and reception wherever you are. Check out their full coverage map here. How can I check if the Three network covers my area? You can find out if Three mobile covers your network using the coverage checker. How can I contact Three? You can dial 333 from any Three phone, or 03333 381 001 from any other phone. How can I find my nearest Three Mobile store? To find your nearest Three Mobile store please use the store finder here.